Public participation is a process where each contributor gains a better understanding of both the issue(s) and how other participants see the issue(s). It is an opportunity for participants to share their facts, experiences, knowledge, ideas, preferences, hopes, fears, opinions, and values. It is a process through which everyone's energy is combined to produce a better outcome. Public participation is effective when each participant not only states clearly his or her own position and interests but also listens to understand those of others. Public participation is most successful when it is well planned, well timed, competently staffed, and has sufficient resources. The "public" in public participation refers to people—individuals who have an interest in or will likely be affected, either positively or negatively, by a decision to be made. Public participation involves people who have a stake in the issue; consequently, the term "stakeholder" often is used when discussing public participation. Stakeholders are individuals or organizations with a concern, an interest, or an investment in a particular issue or resource. When identifying stakeholders, it is important to recognize that decisions can have both current and future impacts; therefore, it may be important to include youth or other future citizens as well as the current public. For example, when county commissioners of a small rural county began investigating possible changes in regional water allocations , they first identified local farmers and other landowners, food processing and other industries, local nongovernmental organizations, public utility staff, school staff and student leaders, and other stakeholders to give them valuable technical and social data. Special-interest groups articulate the concerns of like-minded stakeholders to decisionmakers. 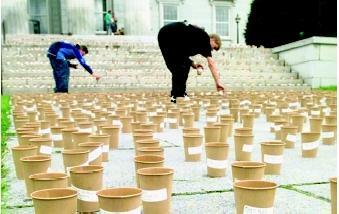 Here, volunteers for the Vermont Public Interest Research Group fill 10,000 "cups of life" with water to represent each person who signed the group's Water for Life petition in 2000. The petition encouraged state lawmakers to pass clean water legislation. input from interested citizens or groups, and then make the decisions after the process is completed. People want to participate in major decisions that are important to them. Water-related issues such as groundwater, water quality or allocation, and streambank habitat management attract public involvement because people are directly affected. Therefore, it is not a question of whether to have public participation but rather how to design a process that yields the most benefits. Benefits to planning and carrying out an effective public participation process include the following. Public participation processes are opportunities for mutual education of everyone involved. Decisionmakers, in a relatively short amount of time, often can get additional information, technical expertise, creativity, and social data about values, attitudes, and preferences regarding those individuals or groups who will be most impacted by their decisions. Public participation may yield changes in behavior. The likelihood of people changing their behaviors increases when they are aware, informed, and self-convinced that the change is needed. Effective public participation provides venues where relationships get strengthened because communication barriers are ruptured, trust is built, and people learn how to functionally work together—all skills that will be critical in addressing future issues. People accept or support decisions that they help make, even when the decisions are hard. Taking part in effective public participation encourages civic and community responsibility in meaningful ways. The lack of opportunities for public participation can lead to frustration, polarization, and even rioting. 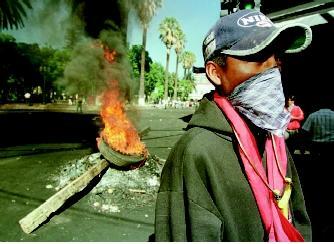 In 2000, citizens in Cochabamba, Bolivia protested increases in their water rates—families earning a minimum wage of less than $100 per month were required to either pay more than $20 or have their taps shut off. Through public demonstrations, which resulted in several deaths, citizens expressed their outrage and demanded to participate in decision-making processes. Public participation will not succeed if it is not genuine—that is, if decisionmakers are using it as a way to sell a predetermined plan or solution and do not truly care about stakeholder concerns. Public participation is not a one-time event such as a public hearing. Public participation processes fail miserably when they have been carried out as a one-way communication or are done behind closed doors or in an environment that promotes defensiveness, distrust, self-protection, or power-brokering. The most common pitfalls associated with public participation are processes that are too little, too late, or too negative or unsafe to be constructive to anyone, either the participants or the decisionmakers. Successful public participation takes adequate time, resources, and flexibility. Public participation is constructive when all partaking listen to each other, make positive contributions, gain a deeper knowledge of the issue(s), and develop trust and respect for each other, even when there is disagreement. As water-related public participation continues to be initiated and carried out successfully, three things will likely occur: (1) more informed decisions will be made; (2) the skills to work cooperatively will be enhanced, thereby increasing civic capacity; and (3) the willingness of people to engage in public participation will increase because they found it to be a rewarding and safe experience. SEE ALSO Conflict and Water ; Integrated Water Resources Management ; National Environmental Policy Act ; Planning and Management, Water Resources ; Policy-Making Process. Creighton, James L. Involving Citizens in Community Decision-Making, 2nd ed. Washington, D.C.: National Civic League, 1992. <http://www.ncl.org>> . Collaboration Framework: Addressing Community Capacity. National Network for Collaboration. <http://crs.uvm.edu/nnco/collab/framework.html> . Environmental Information by Organization. California Environmental Resources Evaluation System. <http://ceres.ca.gov/org/ngo.html> . How to Design a Public Participation Program. U.S. Department of Energy. <http://www.em.doe.gov/ftplink/public/doeguide.pdf> . IAP2 Homepage. International Association for Public Participation. <http://www.iap2.org/> . Watershed Management. Conservation Technology Information Center, Purdue University. <http://www.ctic.purdue.edu/CTIC/Catalog/WatershedManagement.html> . Nongovernmental organizations (NGOs) bring together individuals and groups to pursue an issue on a local, regional, national, and international level. NGOs are nonprofit associations that operate independently of government or for-profit businesses. NGOs have noncommercial objectives related to the environment, consumer and human rights, religion, sustainability, or other causes. Because NGOs are not accountable to government and are not profit driven, they can directly focus on issues, advocating for specifics such as environmental safeguards, access to family planning, or liberalizing tax laws for small businesses. Some wellknown examples of NGOs include The Nature Conservancy, American Rivers, Ducks Unlimited, Water Education Foundation, Oxfam, and International Red Cross.